AFT’s mission to preserve farmland in the U.S. is closely connected to its campaign this summer of 2013 to raise national awareness about our bountiful farmers markets. 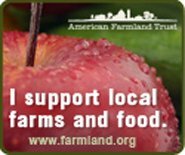 By merely pledging to spend $10.00 at your farmers market at www.LoveMyFarmersMarket.org, AFT, in return, will send its famous trademarked No Farms No Food bumper sticker. The latest number of farmers markets in the U.S., according to AFT, is just under 8,000 with 7,864 farmers market operating in 2012. Take the pledge to spend $10.00 this summer at a farmers market and join in supporting the family farm. This website also promotes the success of food co-operatives. According to a recent report (“Measuring the Social and Economic Impact of Food Co-ops“) issued by “Co + op, stronger together,” which represents 134 National Cooperative Grocers Association (NCGA) co-ops nationwide and their shared commitment “to providing delicious, high quality, healthy food; supporting local, sustainable agriculture; and strengthening local community,” there is a much greater “local impact” when food dollars are spent at food co-operatives instead of conventional supermarkets. Purchases “locally sourced” represent 20% of purchases for food co-operatives compared to 6% for conventional supermarkets, with local suppliers averaging 157 for food co-operatives verses 65 for conventional supermarkets. Similarly, a conventional grocer spends 72% of each dollar of revenue to purchase inventory, but only 4% is spent on locally sourced products while the average co-op spends 62% of every dollar in revenue on inventory, 12% of which is spent on locally sourced products. Co-ops spend a lower % of every dollar in revenue on inventory than conventional grocers because the wages of co-op employees average 7% higher than wages of employees of conventional grocers and co-ops employ more people, with 9.3 jobs for every million dollar in sales compared to 5.8 jobs per million dollars in sales of conventional grocers. The decision to spend food dollars at a food co-operative rather than a conventional grocery store makes sense for the local economy. Shop at your local farmers market and check out the benefits of shopping at a food co-operative! Here in Albany, New York, we are celebrating the grand opening of the Honest Weight Food Co-op’s new store later this week, and the Troy Waterfront Farmers Market, across the river from Albany in nearby Troy (Rensselaer County), is a perfect destination on a Saturday morning. Of course, an ideal economic model for supporting local agriculture is to participate in a Community Supported Agriculture (CSA) farm, which provides economic support and predictability to farmers. By purchasing a “share” in the season’s harvest of a local farm, consumers can know where their food is coming from and have the satisfaction of supporting local agriculture. This website has directories of CSA farms for each of the 50 states and for eight Canadian provinces.